Today’s Santa Anita card is so bad it looks as if it were filled by replacement horses during a horse strike. 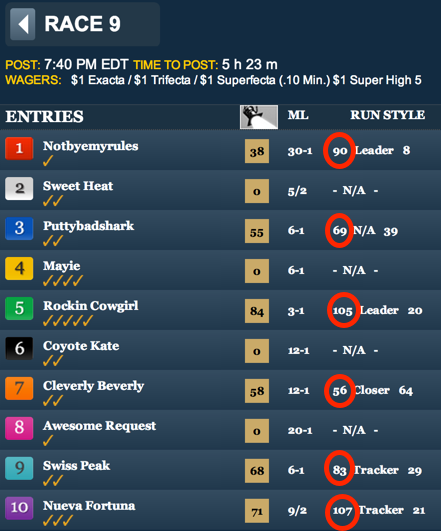 Because there are four unshown horses in race 9, the TimeformUS Pace Projector has no pace projection. However, looking at the Early Pace ratings (a suitable substitute in such instances), we see that Nueva Fortuna and Rockin Cowgirl are expected to show the most early speed of the shown element. And we should add that the morning line favorite, Sweet Heat, has been training as if she, too, is a fast filly. Early speed figures to be a big factor in this race because, in a rarity for Santa Anita, it is being run at 5F. Rockin Cowgirl has several factors in her favor in addition to her early speed. For starters, she will be making her first start for the Robertino Diodoro barn and returning to Southern California from Arizona. Diodoro has had a terrific meet. His horses have been firing up a storm. He gets a fine 83 rating with horses making their first start in his barn, and a 95 rating with horses switching circuits. Rockin Cowgirl will be making her fourth start off the layoff today. She returned to the races with a speed figure of 73, which would probably be competitive today. She followed that up with an 84, and then regressed to a 74. Now in the Diodoro barn, and again going at a distance she should favor, she might well take a step in the direction of the 84, which would make her hard to handle today. The ship from Turf Paradise to Santa Anita does not concern us from a class standpoint. A maiden, she was running against winners at Turf Paradise, and her Race Ratings fit well with those from the races her opponents exit. Moreover, she has run her race on this circuit in the past. The horses who scare us most are Sweet Heat and Nueva Fortuna. Sweet Heat is a first-time starter who has a mediocre Pedigree Rating (57). What is more, her trainer, Kristin Mulhill, is mediocre with firsters (53 rating). But Rafael Bejarano takes the mount, which is essentially a shorthand way of saying that this filly has been training extremely well for her debut. Nueva Fortuna showed talent in her debut, but she weaved all over the racetrack in the stretch. Now she adds blinkers. Color her a question mark in here. Win bet on Rockin Cowgirl. Use Rockin Cowgirl over and under Sweet Heat and Nueva Fortuna in exotics and throw Swiss Peak and the longshot Cleverly Beverly into the 3-hole of trifectas.